Paige Toon was born in 1975 and her dad's career as a racing driver meant that she grew up between Australia, England and America. She lives in north London with her husband and two children. would you mix business with pleasure? I'm Meg Stiles. This is my leaving party. And that song we're making a mockery of? That's written by one of the biggest rock stars in the world. And I'm moving in with him tomorrow. I haven't actually met him yet . . .
No, I'm not a stalker. I'm his new PA. His Personal Assistant. - whatever you want to call it - and I can't bloody believe it! to write his famous friend's biography, helps keep Meg's feet firmly on the ground. But with Johnny's piercing green eyes and a body Brad Pitt would kill for, how long will it be before she's swept off them again? I read Johnny Be Good a couple of years ago and instantly fell in love with the book. I loved reading about Meg, Johnny and Christian as their characters progressed. Meg is down-to-earth and fun loving. Johnny is just AMAZING! I mean who wouldn't him to sing to you? Christian I adored he's the sweet kind of guy every girl dreams about he makes you content and comfortable. I fell in love with Johnny myself. . . No joke! I mean he's just Perfect! Okay . . . lets be honest he's far from perfect, but who is right? I can understand where Meg comes from in the book he's irresistible! And Meg falls deeply in love with him . . . but with him sleeping with girl after girl and the alcohol and drugs becoming a problem what is she to do? To top that all of . . . There's Christian the guy who obviously likes her but is she willing to go there? And then there's Johnny's ex PA Paola who when Meg asks of what went wrong . . Johnny clams up and reveals nothing! I cried when the book ended as I simply didn't want it too end. 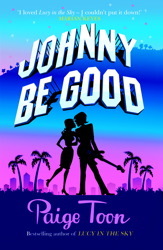 But with the release of the sequel to Johnny Be Good fast approaching I had to read it again. I read in just under 21 hours and loved it all over again . . and yess falling more for Johnny. Though this time when I closed the last page at after 4 in the morning I wasn't upset as I had Baby Be Mine sitting brand new waiting to be read. ﻿He's Not mine, is he? most famous people that ever lived. ﻿Meg is terrified. She lives in the South of France with her doting boyfriend Christian and their beautiful son Barney who has just turned one. Life should be idyllic. But she is living a lie - a lie hat will turn their lives upside down and inside out. Because, as every day goes by, Meg's son looks less and less like Christian. 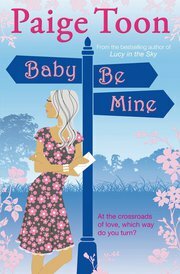 I loved Baby Be Mine! Just to get it over with! I LOVED LOVED LOVED LOVED IT!! Okay now that's that over with. Starting to read this book in the early hours of the morning around 4:45am as I couldn't wait till morning to see what happened. During reading Baby Be Mine it felt like their was an angel and a devil on each side of my shoulders the devil telling me to flick the angel telling me not to . . . in the end . . The angel one! Thank God! Immediately fell back into the swing of things with Meg, Johnny and Christian and again I didn't want it too end. I don't want to spoil the ending for people who have yet to read it as it was officially released today but I bought my copy in Easons earlier last week as they already had them on their shelves! I get what I want . . lets just put it like that . . Paige REALLY gave me what I wanted! I've read the last chapter and the epilogue since I finished Baby Be Mine about 60 times even more no joke. I just can't reading it. I'm really bursting with joy writing this and trying so hard to not give it away. I believe Meg and Johnny's story is finished with. . . I hope not but I think it is and I couldn't have wished for a better ending. It was everything I've been dreaming about since two years ago when I first read Johnny Be Good. I'm really going to miss Meg . . . Johnny. . . . Christian. . . and Barney. . . :( Need to get the tissues out! Also I loved how Paige mentioned Daisy (Paola) and Luis from Chasing Daisy I love Daisy and was so happy when I read the wee bit about them. For me everything was perfect! These will forever be my best books to read and Paige Toon will always be my favourite Author! Thanks to everyone to reads and comments, It really means allot I appreciate it. What did everyone think of my reviews? Have you read one of Paige's books? which one? Did you like it? Never heard of Paige Toon? I literally just bought every single one of her books on amazon - two of them should be here in two days and the rest in two weeks. I'm so excited to start reading some of the stuff Paige Toon writes, although after your review I'm afraid that I'll be finishing these books very fast and then be stuck waiting for the other ones to come in! :) Not too bad of a thing to be worried about though! Thank you for your review. Loved your enthusiasm. I have just added to my author & reading list. I love you review! I haven't read the books yet, but I'm sure they're amazing! I need to pick them up asap!